heehee...I was going to make a spamusement comic similar to this. Its the baby's face that does it. I imagine the quiz would be something like "Q1) have you even caught your man sleeping with another dude?" Dear lord i have a highly defective gaydar and I can tell the guy in that ad is gay!! IanC wrote: Dear lord i have a highly defective gaydar and I can tell the guy in that ad is gay!! so Q1) should actually be "Is this your husband/boyfriend" ? HOW EMO ARE YOU JECK? I think my favourite part is the razorblade with blood on it. Also, if we're moving threads around, this is a prime candidate to be shuffled over to the Internets forum. I read that as "uninformed". Heh. Who wants to date clueless people!? CLICK HERE! Binkatron5000 wrote: I read that as "uninformed". Same here, but I only misread the second uniformed. I couldn't for the life of me figure out why someone would want to date uninformed proffessionals, and what uniforms had to do with it. Same here, but I only misread the second uniformed. 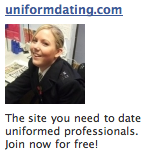 I couldn't for the life of me figure out why someone would want to date uninformed professionals, and what uniforms had to do with it. Perhaps uninformed professionals tend to be uniformly stupid? I saw that. Threw me a bit. PonderThis wrote: Perhaps uninformed professionals tend to be uniformly stupid? I'll take "In Name Only" for $300, Alex. 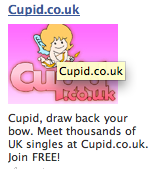 More dating ads from Facebook. 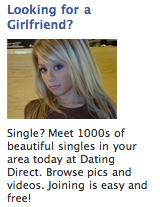 I know Facebook just picks up ads based on your profile... but its getting really annoying to have dating ads like these pushed on me. My relationship status isn't even single and I get those all the time. "Today these three contestants will win thousands of dollars in cash and prizes as they battle it out to become today's champ...on...WHAT DO YOU SMELL LIKE TO EDWARD CULLEN? And now here's the host of What Do You Smell Like To Edward Cullen....WIIIIIIIINK MARTINDALE!!!"